I have a confession to make: My hair is looking pretty darn crappy right now. Yes, we natural hair and loc'd folks always rave about how beautiful and wonderful our curls, kinks and knots are, and while they are that overall, I must recognize and acknowledge that we have our bad hair days (weeks/months) too. This is especially true for those of us with locs that are not yet mature (baby and teenage). 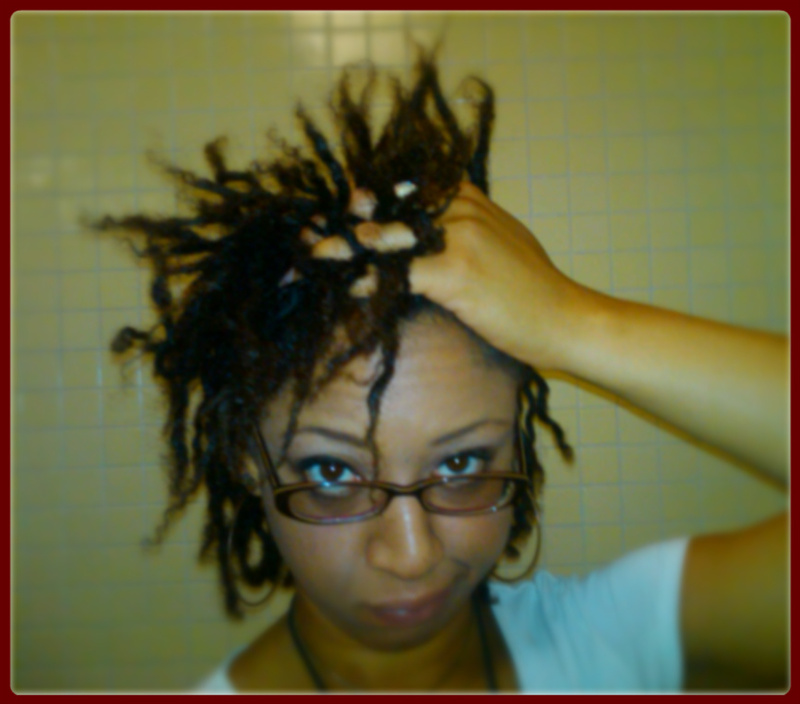 I love my locs, don't get me wrong, but right now I wish I could wrap them up in headwraps til November (my 1 year mark). The term "teenage locs" is not a misnomer, and like real teenagers, sometimes they like to challenge you and disobey and must be put on punishment, or just sent away to their room so you can take a minute to think and breathe. No, my locs are not cooperating right now. I twist them, they come untwisted. I part them one way, they flop the other. I plan elaborate styles that work one week and fail miserably the next. The ones in the back are doing some weird flip up thing at the ends. They're too long to be short, and too short to be long. A few stick out randomly in crazy directions. Most of them are solid locs, but a few of them are still like to hold onto their un-loc'd roots for a little longer than the others. And the ends show no sign that they ever plan to loc......ever. So what am I doing to get through this phase? Nothing. Waiting it out. Carrying on like nothing is wrong, going with the flow of what my locs want to do on a particular day, and just not worrying about it. Part of having natural hair is letting go that desire and need to control, to tame, to train. I am working with my teenage locs, not against them, and in turn they are working with me. I may have a particular style all planned out in my mind, but if it doesn't turn out the way I thought it would, I just go with something else that does work. When people ask "How did you style your hair like that?" I have to honestly tell them "I'm not really sure." Things are just kind of haphazard and crazy right now. Is this to discourage anyone from locking? Goodness....by all means, no. I still am having a very active love affair with my locs, and the vast majority of time my hair looks crazy and frustrating only to me. This is just a phase they--and I-- are going through. I embrace the challenges, but I am still recognizing that they are challenges. The reason why I'm bringing this to light in the first place, even though I'm natural hair and loc's biggest fan, is not to scare people away, but rather because I believe people need to know what they are getting into before they get into it. Before someone starts locking, they need to know "Yes, I will go through this rough phase, but yes, I will also come out on the other side with beautiful locs." It is better to know up front and mentally prepare for what to expect than have others gloss over this for you, leaving you surprised, bewildered and frustrated when it happens to you, and having you think that something has gone wrong with your head. I'd rather people decide up front that maybe locking isn't for them instead of getting months into it and giving up because they didn't know what they were going to have to (temporarily) deal with. I prefer to tell it like it is-- the good, bad, ugly and beautiful. If you are someone going through this phase, hang in there; it will get better. If you know someone going through this phase, please don't give them a hard time because later you'll be eating your words when you're complimenting their mature locs. And if you are thinking about going through this stage (i.e. anyone thinking about locs), don't be afraid. We've all gone through it. what you described is the exact stage or moment I am in!